Deanna was adopted by one of her foster familes. She is now in her forever home! She lives with two other bunnies, DJ and Curly Sue as a trio. Deanna is a tiny, very young dwarf rabbit was found "stray" after someone abandoned her near a park in San Jose. She was brought to a nearby shelter by a neighbor who noticed her just sitting in the street, dazed. She came in with severely injured eyes -one VERY BAD. It is hard to imagine what could have caused such significant deep injuries to the eye- perhaps a predator. She was barely able to eat or drink. Her eye was covered in pus and was almost sealed shut. The shelter didn't think she would make it. Fortunately, through the kindness of a shelter volunteer, The Haven was called in to look at her. Sadly, her eye had already fully abscessed by the time we found out about her. When I first looked at her, she sat very still in the back of her metal shelter cage shivering. 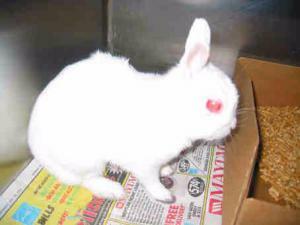 Just one tiny white bunny, a liter box and piece of newspaper & food and water. She was so sad, so alone and clearly miserable . The entire side of her head was swollen and her eye was filled with debris and pus. She could not see us, had barely any energy to move and was close to death. She had been in that room at the shelter for 4 days. The vet there had given her ointment for her eyes during her stray-hold period. Of course, this tiny, scared and damaged dwarf came home with us at Rabbit Haven. She went to a vet and was put on heavy pain meds, eye hot packs, antibiotics, antibiotic eye drops and hand feeding. Even the vet was a bit stunned to see the significance of her eye injuries. We named her Deanna, Dee for short. Dee improved so much in just a few days. One of her eyes became clear enough that she could see out of it. During the time she was with us she was kept on a careful regime of medical care and dietary support. She began eating on her own, and had much more energy. Unfortunately, we observed signs that the infection level was increasing again causing eye swelling, discharge and increased pain. We could not save the eye even with intensive care we have been providing. Her eye had to be removed in order to save her life. After a $650 surgery and lots of care, she is back on her feet again. 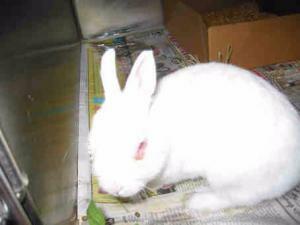 The Rabbit Haven rescues abandoned rabbits and accepts surrendered rabbits from the general public and shelters in Santa Cruz, Santa Clara, Contra Costa, San Benito and Monterey Counties. We then work to place these rescued rabbits into loving foster homes, secure medical care including needed spay neuter, and then place them into permanent homes. The Rabbit Haven works in the community, at schools, with shelters, and other education groups to educate the public on rabbit care, feeding, grooming, medical needs, social dynamics and behaviors.